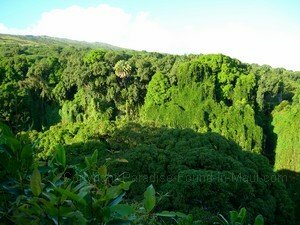 Pipiwai Trail: Pictures from Our Day with Hike Maui! Our trek on the Pipiwai Trail with Hike Maui was one of the most memorable hikes I've ever been on, and yielded some GREAT Maui pictures! Everywhere we looked, there was nothing but beauty. Here are a few of our favourite Maui pictures from that day. When we came to this part of the trail, everything opened up before us and we were able to see the lush jungle treetops and greenery covered cliffs that seemed to go on forever. The incredible lushness of the greenery never ceased to amaze me! Another highlight of our trip with Hike Maui on the Pipiwai Trail was the bamboo forest. 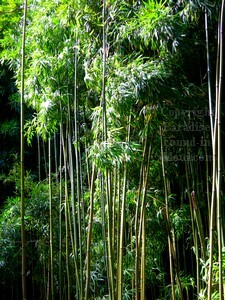 The bamboo forest was enormous, and stretched on as far as the eye could see. Do you what really surprised me about bamboo? It's capable of growing to its full height in only 3-4 months! 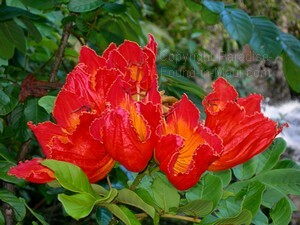 Here is a picture of my absolute favourite of all the flowers we saw in Maui: The African Tulip. I just loved the combination of the rich red with the orange accents on their blooms. We saw numerous African Tulip trees throughout our day of hiking... we'd look up to see a gorgeous green canopy dotted with these stunning blooms above us! And of course, no jungle hike would be complete without coming across at least one banyan tree, and this one was no exception! We just loved the way the light filtering through the jungle seemed to make this tree look like something out of a fantasy movie... so pretty! Want to See All of This Like We Did? You have 2 choices. If you're very budget conscious, or just prefer to go solo, you can definitely check out this trail on your own. It will cost you no more than the cost of gas to drive there, a picnic lunch and admission to the park. Why do I recommend Barefoot Tours? Click here to find out! 1) To read all about our day of hiking on the Pipiwai Trail with Hike Maui, click here! You won't believe it when you hear about who our hiking companion was! 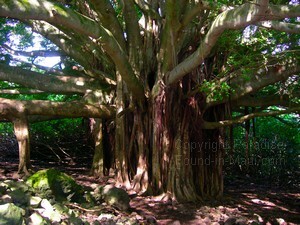 2) Go to Maui Pictures: Some of my Favourites!